What if someone came along who had a plan for building a 4 or 5 place, state-of-the-art aircraft that would land and takeoff vertically, fly 370 miles an hour (322 knots) at 25,000 feet, and had a 1,000 mile range? Do you think busy corporate executives would like to have such an aircraft? Do you think government agencies such as the military, Coast Guard, law enforcement, boarder patrols, and firefighters could use such an aircraft? And what about oil & gas production, pipeline patrol, traffic checks and news reporting, the American Red Cross, medevac, and numerous other entities needing such an aircraft? Well, there you have a cross-section of what is destined to become the cause of the greatest paradigm shift in general aviation since the invention of the helicopter. Questions remain: What type of aircraft can accomplish this feat of taking off and landing vertically and yet fly 370 mph at 25,000 feet? Is it complicated? Does it have a rotary wing? Does it have fixed wings? Is it jet powered? Why hasn’t some big aircraft company like Bell come up with such an aircraft? These and many other questions will be answered as we proceed to give you a complete picture of what this aircraft is all about. We have two such aircraft . . . that is, very fast aircraft, and capable of vertical takeoff and landings, yet distinctly different. The second is a totally new type of tilt-rotor aircraft having twin engines and is capable of carrying eight people and flying at around 455 mph or close to 400 knots at altitude. That is our present design; however, this patented design can be scaled up or down. The patent is extremely significant because it introduces a concept so revolutionary that it greatly improves efficiency, greatly reduces both the purchase price and operating costs, greatly reduces complexity, and greatly improves safety. Either aircraft will cause a paradigm shift in both general and military aviation, but with the two together, the shift becomes staggering. One patent (US Patent #7,275,711) concerns itself with what we call our Colibrí I aircraft. Colibrí is Italian for Hummingbird. Generically, we define it as a Compound HELI-jet Aircraft. The other patent (US Patent #7,147,182) is relative to our Commander II aircraft. Generically, we define it as a TIP-jet TIL-ROTOR aircraft. The technology described in this patent can greatly enhance the performance and reduce the costs of current tilt-rotor aircraft such as the Bell Boeing V-22 Osprey and the Bell Agusta 609 commercial tilt-rotor. Background Discussion: In 2011 the US Department of Defense issued “The Future Vertical Lift Initiative: A Strategic Plan for United States Department of Defense Vertical Lift Aircraft” and with this release the quest for next-generation vertically lift capabilities was formalized. In part, the DoD’s goals for “Future Vertical Lift (FVL)” were driven by assessing the maturity of both existing and emerging technologies from within their established OEM supplier base as well as identifying key non-traditional, high-tech startups. In addition to the military requirements, the commercial market drivers for advanced vertical lift, including heavy logistics, search and rescue, and general aviation, prompted many aerospace companies to conduct Independent Research and Development projects focused on commercializing generational-leap technologies. One successful company, Advanced Aerospace Technologies, was awarded two landmark US patents, 7,147,182 and 7,275,711, for VTOL aircraft designs utilizing reaction driven rotor technologies. These design patents termed “Tiltrotor” and “Compound” aircraft respectively, were inspired by an innovative concept called “thrust augmentation” hypothesized by Professor J.V Foa, Professor of Aeronautical Engineering at Rensselaer Polytechnic Institute. Professor Foa contended the thrust of the aircraft could be increased without an increase of energy input by placing “reaction drives” at the rotor tips. By utilizing these reaction drives, new VTOL designs can now eliminate the heavy, expensive, high maintenance transmissions, drive shafts, clutches, and backup systems making the aircraft more efficient, more effective, and with lower total ownership costs and ease of operation. The primary difference between the two designs is the Compound aircraft only uses the rotor for takeoffs and landings whereas Tiltrotor the rotors are required for forward flight. Highlights and Accomplishments: Both designs have been through a rigorous and independent Preliminary Design Review by AirBoss Aerospace, an aeronautical engineering firm, contracted by the company. Furthermore, a quarter-scale model of the rotor assembly was built and tested by the company with remarkable results. Our computer analysis of the 2150 Kg Compound aircraft could cruise at 325 knots at FL250, while the 3475 Kg Tiltrotor is expected reach 400 knots at the same altitude. Finally, Advanced Aerospace Technologies was honored to collaborate with the Georgia Tech Aerospace Department in evaluating reaction versus conventional drives as part of their participation in the annual International Rotorcraft Design Competition sponsored by the American Helicopter Society in 2013. Current Market Assessment: Multiple strategic aerospace companies including Textron-Bell, Lockheed, Boeing, and Sikorsky along with venture startups AVX, Carter Aviation Technologies have been highly active in positioning within the $115B FVL market with Textron eventually purchasing exclusive rights to Carter technologies. 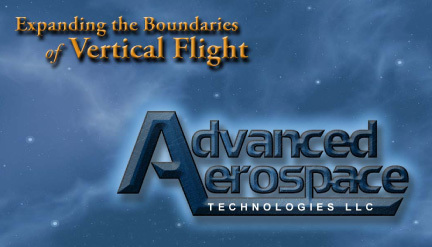 The Opportunity: Advanced Aerospace Technologies is actively soliciting and evaluating proposals from strategic-OEM companies looking to acquire exclusive rights to our patents to develop, design and commercialize these technologies for both commercial and military FVL applications.